In March, I was lucky enough to snag a last-minute tasting appointment at Merry Edwards Winery, located in the renowned Russian River Valley region of California, about 70 miles north of San Francisco. We were staying in nearby Bodega Bay on a family vacation, and it was an irresistibly short trip from there to get to wine country. I took off on the scenic drive through fat green hills dotted with sheep and dairy cows to the land of Pinot Noir and Chardonnay. Flash forward to last week: Wednesday morning was starting off like a real pain: We were all passing around a horrendous cold at home. I had to pick up my car from the shop at the crack of dawn. And it was pouring rain. But no matter what, I was determined to make it to The Texas Wine School for a morning presentation from Merry Edwards Winery. Open to wine industry professionals, The Houston Sommelier Association holds these educational seminars on a bi-monthly basis, and it was a very serendipitous coincidence that my new favorite winery was the subject. What made it even cooler, after all of the morning’s nuisances, was to walk through the door and discover that none other than “The” Merry Edwards herself was the speaker! 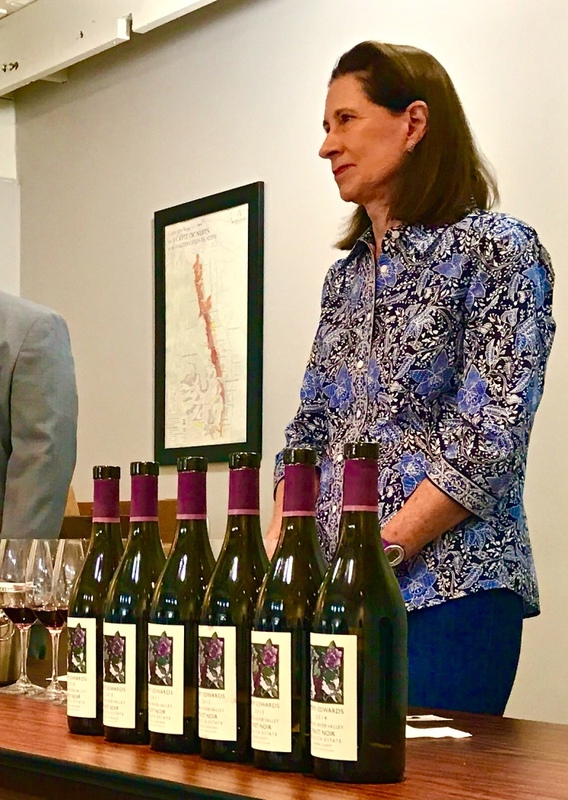 Often referred to as “The Queen of Pinot,” Merry was one of the first winemakers to understand the potential of the Russian River Valley area of Sonoma County. In fact, the Russian River Valley AVA has become the epicenter of California Pinot Noir and, many would say, the world’s epicenter for fine Pinots. Merry was one of the first women to graduate from the UC Davis Masters program in viticulture and enology. Her determination to succeed within an industry which at the time could not wrap its mind around the notion of a woman winemaker, her groundbreaking use of viticultural cloning, her 2013 James Beard Award for Outstanding Wine, Spirits or Beer Professional–it would have been easy for Merry to focus her presentation around these milestones and other accomplishments. But listen to her for 5 minutes, and it becomes crystal clear: It’s not about her, it’s only about the wine. Though Merry said she does not seek to impose an overriding style on her wines, it’s hard not to notice that she and her wines have a lot in common: Lithe and clear-eyed, stylish yet understated, she has a singular focus on doing whatever it takes to bring out the very most using soil and grape and science. And the proof of her success was lined up right there in front of me, a vertical flight of Merry Edwards Meredith Estate vintages ’09 through ’14. We swirled and sipped as Merry described the monumental task of getting things up and running in Russian River Valley back in 2005, the yearly joust with the elements, and the challenges of keeping the integrity of the Russian River Valley AVA intact. The merits of aging were really brought home as I tasted the vintages before me. Though the 2010 and 2011 had received the highest praise from the wine press, it was the 2009 that struck me as the most alluring. Time in the bottle does wonderful things to a wine, and I know I need to redouble my patience and hold on to my special bottles for a good deal longer before opening them. After the seminar, I spoke with Merry for a moment and told her how much I had enjoyed my recent trip to her winery and how fortunate I felt to get to meet her only a few short weeks after my visit. As we talked, she handed me her card. Another fantastically written article—this one about one of my favorites—bravo! Thank you! High praise from one of my favorite wine bloggers.